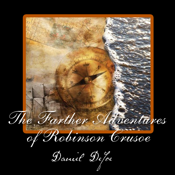 The book starts with the statement about Crusoe's marriage in England. He bought a little farm in Bedford and had three children: two sons and one daughter. Our hero suffered a distemper and a desire to see "his island." He could talk of nothing else, and one can imagine that no one took his stories seriously, except his wife. She told him, in tears, "I will go with you, but I won't leave you." But in the middle of this felicity, Providence unhinged him at once, with the loss of his wife.